Budget ribbon grade suitable for most paper and synthetic materials but print lacks long term durability. Smearless ribbon ideal for most applications except those requiring aggressive chemical or temperature resistance. 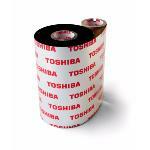 Scratch and solvent resistant ribbon ideal for applications requiring a high degree of print durability.